Central America covers only 0.5 percent of the Earth’s surface, but is home to 7 percent of all animal and plant species on Earth. Despite population growth, expanding agriculture and logging, this small land bridge that connects North and South America offers a breathtaking variety of landscapes and habitats. Bound by the Pacific and Atlantic oceans, the world’s second largest barrier reef, and coastlines of twisted mangroves – covered in dense jungles, cloud and pine forests where wild rivers flow, and in the shadows of windswept volcanoes reaching 4000 metres into the sky – Central America is one of the most exceptional places on Earth. Over a hundred years ago, when Central America was untouched by civilisation, the entire land bridge was covered in dense rainforest. Pine and oak forests grew above 1,000 meters and even higher up, cloud forests flourished. Only the highest peaks of the many active volcanoes and the steepest slopes of the central mountain range remained barren. Progress changed that – but large patches of this glorious wilderness still exist. In refuges like Costa Rica’s Corcovado National Park, 460 square kilometres of lowland and mountain rainforest remain protected. It is one of the last strongholds of South America’s largest cat, the jaguar – a secretive hunter that frequents the banks of the Tigre and Agujas rivers. The most audible if not the most visible creature of the rainforest is a tree-dwelling primate known as the mantled howler – for good reason. Males howl at dawn and dusk and also in response to disturbances. Their grunts and repeated roars are so loud that they can be heard many kilometres away. The howler monkey may find safety high in the rainforest canopy; however, it should be wary: in some remote areas, the canopy is scanned by the largest raptor of the Americas, the Harpy eagle. Females have wingspans over two metres and can weigh up to ten kilograms. They can easily catch sloths and monkeys that are almost their own body weight. Breeding pairs build large nests in the canopy which they may use for several years, but only one egg out of two is incubated. The high country with its cloud forests, open grassland and volcanic slopes is home to some of the most stunning and beautiful bird species on Earth, like the fiery-throated hummingbird and the resplendent quetzal. The quetzal’s plumage is like an iridescent rainbow with hues from green-gold to blue-violet – and during the breeding season, males develop tail feathers nearly a metre long. 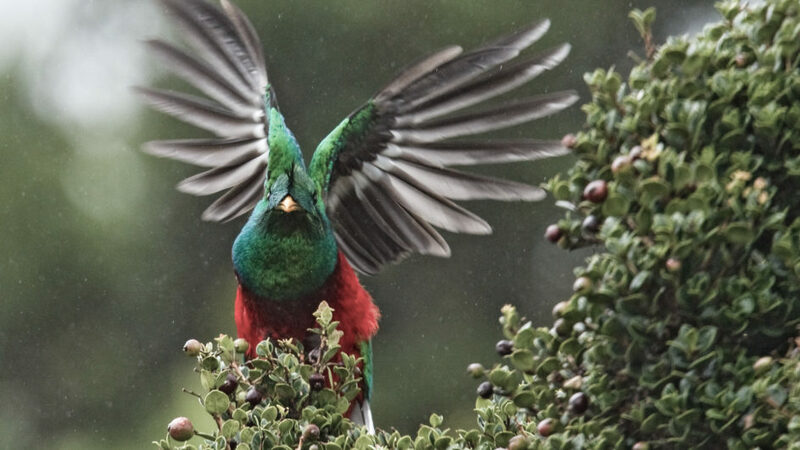 It is not surprising that the Aztecs and Mayas believed the quetzal to be divine. Hot and humid lowland forests and wetlands stretch from the foothills of the central mountain ranges all along the wild rivers that finally drain into the Pacific Ocean and Caribbean Sea. The wetlands are home to a fierce apex predator – the American crocodile. This giant reptile prefers water with a little salinity – it’s at home in marshes, mangroves, small lagoons, and even dark, brackish lakes. But these crocs hunt smaller prey than their African cousins – preferring fish, reptiles and small mammals. The American crocodile shares its habitat with the bizarre basilisk lizard – also known as the ‘swimming alien’. This lizard can run at great speed across the water’s surface; it’s also an excellent free diver, able to stay submerged for up to half an hour! The lowland forests of Costa Rica are home to the largest land mammal in Central America – Baird’s tapir. This plant eater weighs up to 200 kilograms! A solitary animal, Baird’s tapir spends its waking hours foraging for leaves and fallen fruit or cooling off in forest streams. Another strict vegetarian prefers to live one or two floors above the tapir – it’s the two-toed sloth, Choloepus. The Choloepus has a unique physiology that allows it to tilt its head back at a 45º angle to look for food or danger while hanging from a branch. A slow mover and a slow feeder, the Choloepus enjoys a variety of leaves, flowers, fruits, buds and shoots. In the rainy season green algae sometimes grows in the sloth’s hair helping it to blend into the forest – a perfect camouflage to evade predators! Sloths share the canopy with ring-tailed coatis, relatives of the racoons. The South American coatis also frequent the forest floor and are active during the day. Unlike the sloths, coatis are omnivorous with a diet that includes fruit invertebrates and bird eggs. They search for fruit high in the forest canopy, or use their snouts to poke through crevices to find prey. While female coatis live in large bands, males are usually solitary. But the most colourful and emblematic of the canopy dwellers is the scarlet macaw. In a few well-protected areas in Central America, large flocks of these magnificent parrots can still be seen feeding in the mangroves before returning to their roosts in the steep forest slopes. Central America is a land of volcanoes and rain forests, but in fact it is dominated by water. With the Pacific Ocean to the east and the Atlantic to the west, the region is bordered by 6,500 kilometres of coastline. The Pacific coast is dryer than the Caribbean shore and the water is cooler thanks to a massive upwelling from deep layers. The waters are rich in nutrients – the perfect environment for big pelagic fishes and whales. The largest animal on Earth, the blue whale, is a frequent visitor, particularly off the Costa Rican coast. The waters around Jicaron Island in Panama are close to steep ocean canyons, which in turn are highways for large predators. Here, orcas and yellowfin tuna hunt their prey. Further north, on the inside of Costa Rica’s Osa Peninsula lies a fifty kilometre long gulf –Golfo Dulce – one of only four tropical fjords in the world. Golfo Dulce is a refuge and birthing place for migrating humpback whales, dolphins and endangered hammerhead sharks. Here, spotted dolphins gather in large groups of up to five hundred individuals to hunt and play in the sheltered waters. The hot and humid Caribbean Coast is a different world. Its most prominent feature is the Belize Barrier Reef – the largest reef system in the Northern hemisphere. The reef is 250 kilometres long, filled with hundreds of sand cays and three atolls. On Glover’s atoll scientists have been studying the behaviour of Caribbean reef sharks for more than a decade. The reef sharks and other shark species live near the open ocean. Only the juveniles spend their first years in the deep, sheltered lagoon of the atoll. The sharks are territorial, but migrate in May to feed on spawning snappers. The endangered Nassau Grouper is also being carefully monitored by researchers. This massive fish weighs more than 25 kilograms – despite its dwindling numbers, hundreds of groupers still congregate at the spawning sites on Glovers reef.